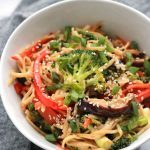 Spicy Teriyaki Ramen with Sriracha – Sautéed veggies, tender buckwheat ramen noodles tossed together in teriyaki sauce and a touch of heat from sriracha makes a quick and easy gluten-free meal. I find ramen to be a very quick and easy meal to put together, and that’s a good thing after a long day at work. Contrary to the name, buckwheat is not a grain, it’s a gluten-free seed loaded with protein and fiber. It’s also known for its benefits for heart health, diabetes and it may help lower inflammation. For vegans and vegetarians who don’t eat meat, buckwheat provides some of the essential amino acids that our bodies need and can’t make on its own, animal protein is the major source for these amino acids. Eating buckwheat helps provide meat-free eaters the full range of essential proteins our bodies need. 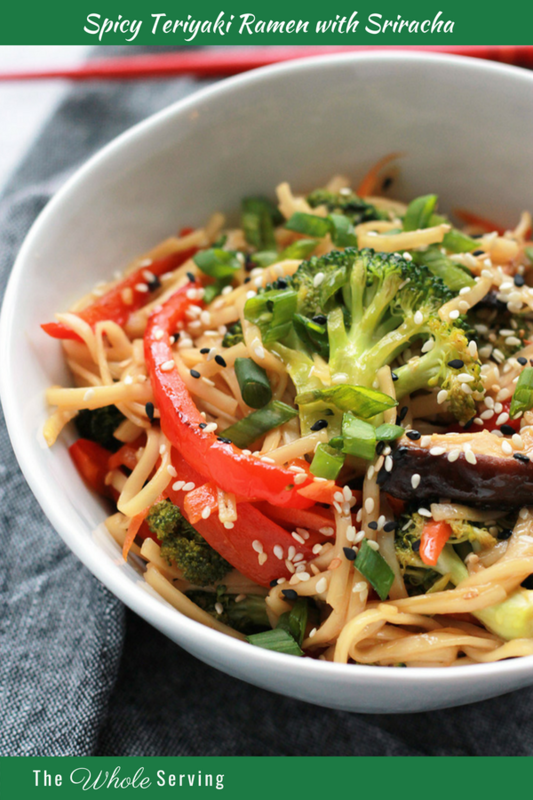 The wonderful thing about buckwheat noodles is it takes very little time to cook, making this a quick and easy meal. 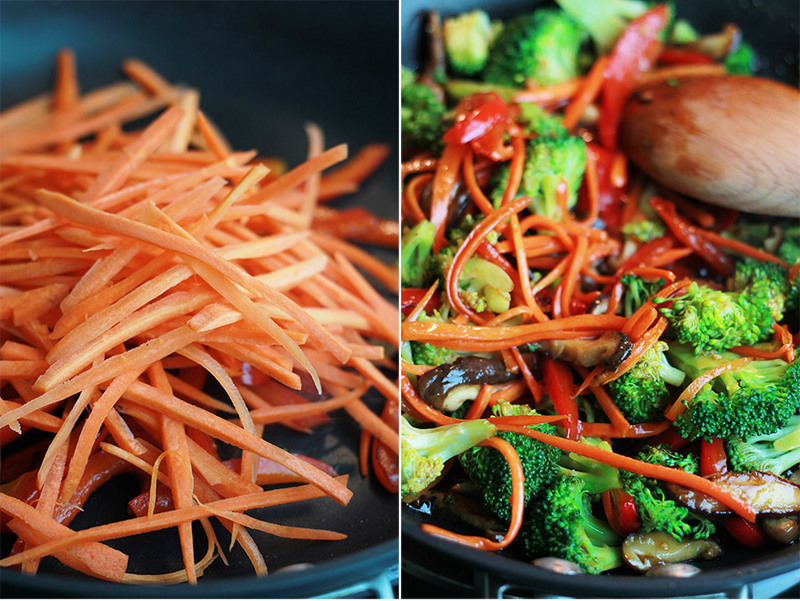 TIP: To make this meal quicker, pre-cut the veggies. Stem mushrooms and cut into strips, about ¼ inch. Discard the stems. 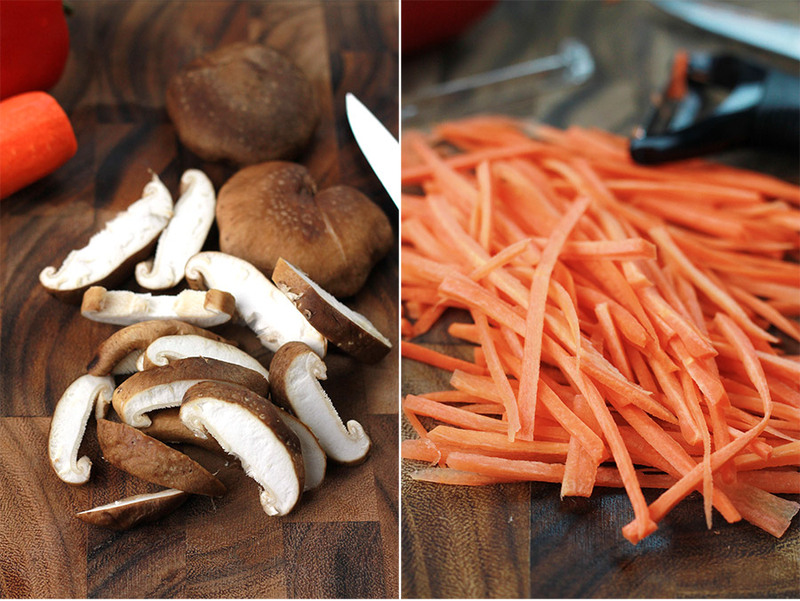 Slice and cut carrots into julienne strips. I like to use a handy-dandy julienne veggie peeler. Stem, seed, and slice red bell pepper into ¼ inch strips. Halve the strips. 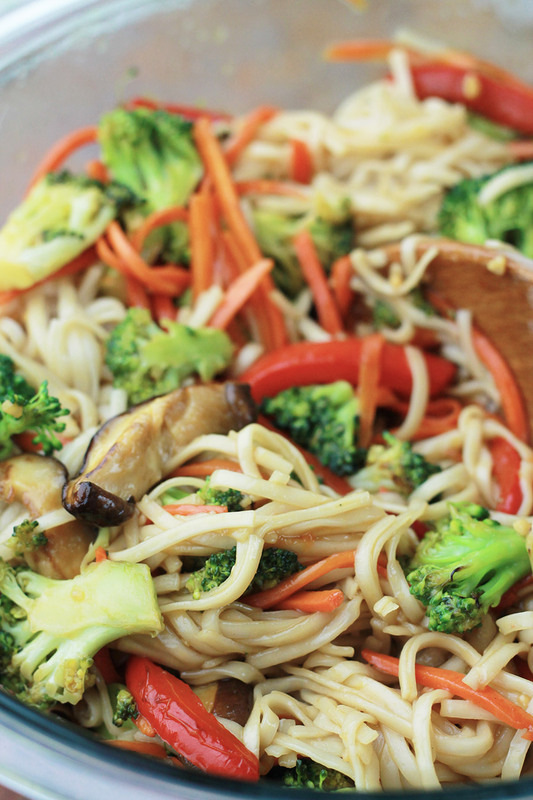 Bring water to a boil in a stock pot and prepare noodles while sautéing veggies. Toss with a bit of oil, set aside and keep warm in a large bowl. In a large skillet, (I used non-stick), over medium heat add olive oil, mushrooms, and broccoli, sauté until veggies start to become tender, about 2 to 3 minutes. Transfer veggies to a large bowl. Return skillet to burner, add more oil if needed, sauté red bell peppers 1 to 2 minutes, add carrots to pan and continue to sauté another minute or so. 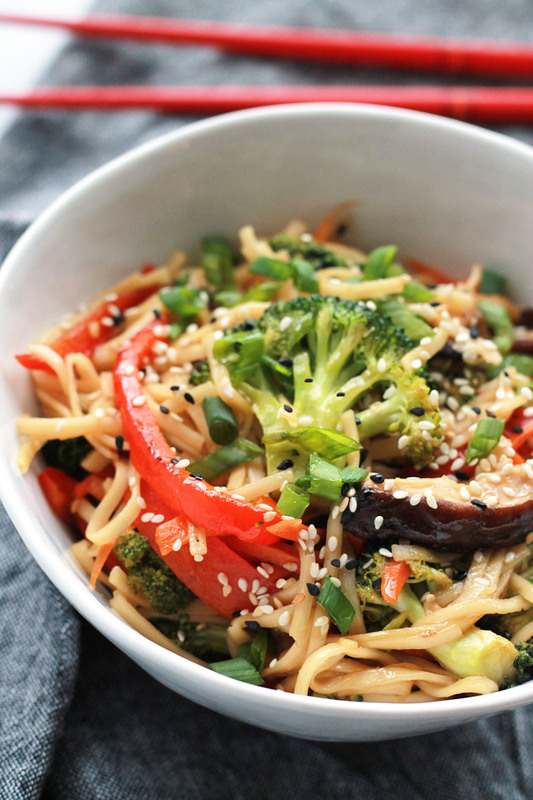 Add peppers and carrots to bowl with mushrooms and broccoli. Add teriyaki sauce, garlic, sesame oil, and 3 tablespoons of water to skillet, stir to combine. 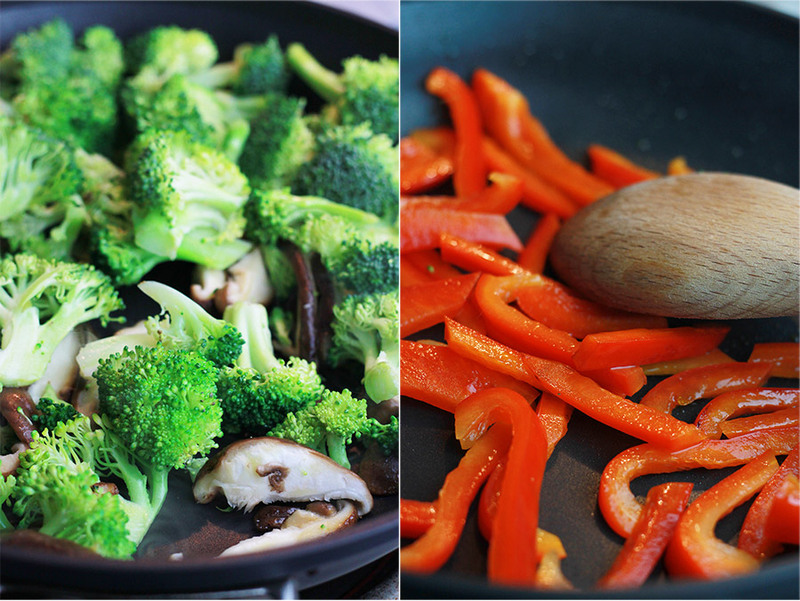 When sauce starts to bubble, add all of the veggies back to skillet. Stir to coat. 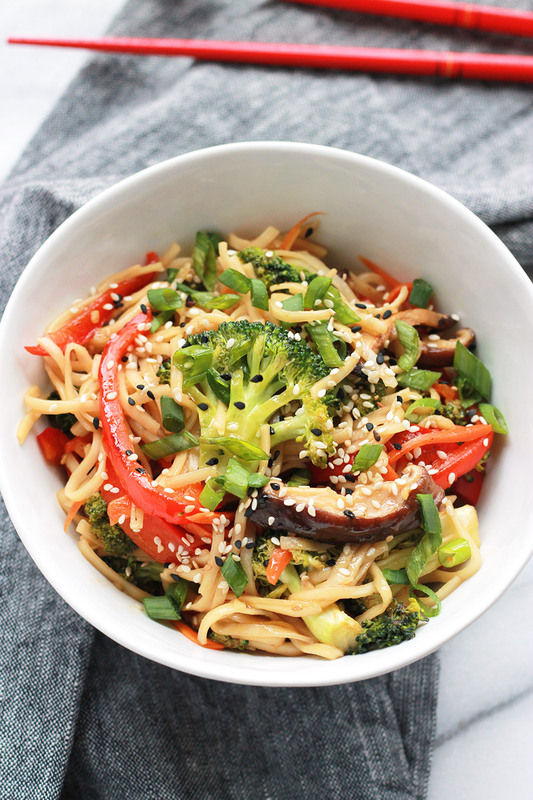 Transfer veggies to bowl with pasta and toss together. Season to taste with sriracha. Serve garnished with sliced scallions sesame seeds. If you make this recipe or a version of it, take a picture and share with me, I’d love to see or hear about your version of Spicy Teriyaki Ramen with Sriracha.